Recently I attended the Chick-fil-A Leadercast conference for a day of professional (and personal) growth. It’s a day filled with speakers who encourage men and women to grow as leaders in their companies. I have attended this event for the past six years and it is always time well spent to learn, grow, and recharge. 1. Becoming uncomfortable leads to growth. John made this statement about becoming uncomfortable, which made me nod in agreement and cringe at the same time. He was uncomfortable when he changed positions from starting pitcher to closer, but I’d say that stepping outside of his comfort zone was definitely a home run! It’s easy for leaders to reach a place of being comfortable, but that’s often what leads to doing the same ‘ol, same ‘ol. Becoming uncomfortable and questioning why/how we do things to figure out if there’s a better way is what often leads to growth. 2. When you live for yourself, you become smaller. Purpose is found across from what’s in it for me. I love that. I truly believe who we become is determined by who we serve. 3. Little moments create big outcomes. My biggest takeaway from Molly’s speech was to step into opportunities with boldness. She talked about some of her life experiences where she just “went for it.” She took the wins and learned from the losses along the way. 4. When there’s an obvious problem, solutions are clear. If you’ve paid for something with a credit card through the little square box on someone’s iPad or smartphone, Jim is the guy behind that invention. He really talked about it in a humble way like “yeah, I just had a problem with it in my store and needed a solution.” He solved a problem for millions. I have a million ideas. But here’s the problem with that. They are in my “idea vault” and I never pull any of them out and just go for it (it’s that darn caution mindset again). If everyone did that, we’d never have Spanx for figure slimming or an iPhone to remind us to work on our figure! Seeking solutions is a win-win! 5. If you confuse, you lose. I attended this event to grow as a leader for my day job, but Donald Miller gave me pages of “to do” notes as a blogger! (My colleague even asked- why are you writing so much- ha!) His message was simple… if you confuse, you lose. People will buy your product if you are simple and clear about what it will do for them. Again, his presentation really hit home with me as a blogger. It’s not about me, it’s about how to provide value to virtual visitors at Simple Organized Lifestyle so that they become real relationships. This girl has incredible wisdom beyond her years at age 25. She was a fantastic speaker who talked about the value of meaningful work. She described two of her friends who worked as janitors at Disney. One viewed the job as a dream come true and the other hated it. Same job, two very different perspectives. Jess is the founder of Headbands of Hope. When anyone purchases a headband, another one is sent to a child who has lost their hair due to chemotherapy. Talk about the value of meaningful work! I loved this message. We can create meaning in our day to day if we choose to do so. To go back to her original example of the two friends, we can be the worker who sees the trash on the sidewalk or the one who sees the trip of a lifetime. We choose! 7. A great person is a sentence. Dan is an author/expert on workplace motivation. He talks about Clare Booth Luce telling President Kennedy that “A great man is a sentence” and applies that to today’s context. It’s explained in his vide below. Suzy talked about different leadership qualities that create a healthy and productive environment. She learned early on from big mistakes and determined to turn those into opportunities for growth. 9. The wise adjust to feedback and they learn. My takeaway from his speech was to seek feedback, for better or worse, and use it for getting better! 10. Carry correction alongside compassion. Tyler Perry is great speaker as well as actor. His background story is inspirational and he really does have a serious side! He talked about what it feels like to find your purpose and how to use your influence to set the example for others. I can’t think of better words than his, “a leader has to be ALL IN” to conclude a day of focusing on leadership and being powered by purpose. 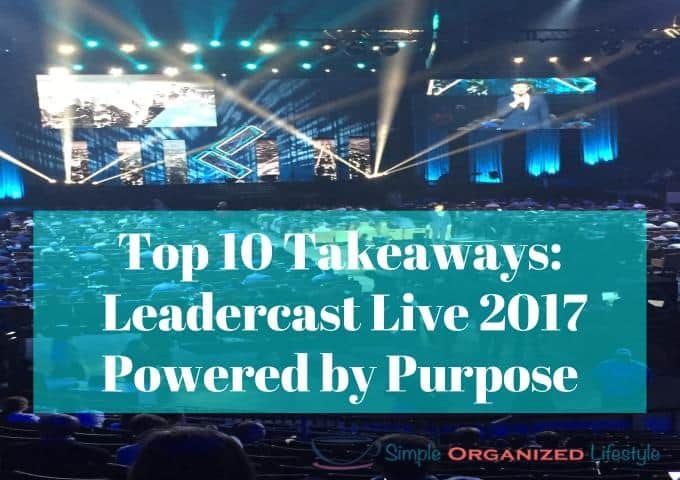 The Leadercast Live 2017 Conference, Powered by Purpose, was an awesome opportunity for professional and personal growth. If this event has a satellite location near your area next year, I highly recommend it!